This lovely garden at Floors Castle surrounds one of Scotland's finest houses and has fine views across open countryside. 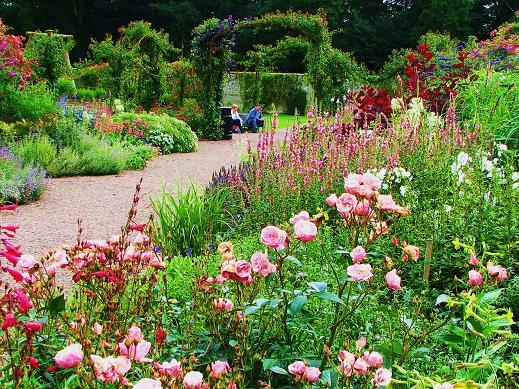 Floors Castle has an amazing walled garden with extensive and very colourful herbaceous borders, fruit cage , vinery and peach house. 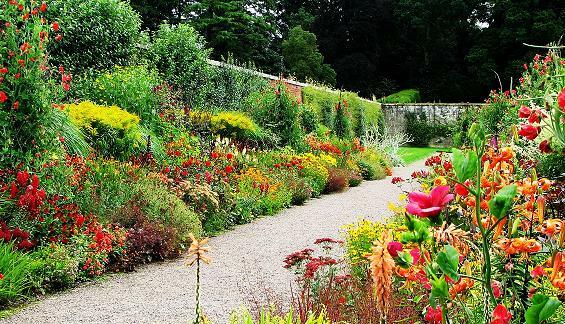 The hot border is stunning in August with an amazing display which is a feast for the eyes. The Star plantation has a series of radiating paths through a woodland garden. The millennium parterre features the linked initials of the Duke and Duchess of Roxburghe. Good displays of rhododendrons and azaleas in the early season. 2019 - Floors Castle and Garden - Opening times -Garden open year round (see website for more details) Castle open from 1 May. Dogs on leads are welcome in the Castle Grounds. Winter and out-of hours visits for groups by prior arrangement. Disabled access, restaurant, shop. If you want to take a break near Floors Castle, why not stay in one of our recommended hotels. Special prices up to 70% off standard rates as well as hundreds of exclusive deals. Look now - click here.